How do I open the context menu from a Mac keyboard? When I make a spelling error in a document, Lion gives me the option to correct the error by right-clicking (or ctrl-clicking, two-finger tapping, etc) on the misspelled word and bringing up the context menu. How can I open this menu from the keyboard? And is it possible to access the Context Menu from a Mac keyboard? Whenever I see this question in the Internet or I ask it to someone .. people always misunderstand. Maybe because they are not Windows users, or they are Windows users who don't use the keyboard short-cuts. I always have the same question but I didn't find the answer yet. When this Menu key is pressed, OS will assume that you right-clicked the highlighted/active element > then it will show you the context menu even if the mouse pointer is not pointing to the highlighted element. So this feature seems to be missing in Mac OS. And whatever suggested solutions, even Enable Mouse Key it always require you to point/move your mouse pointer to element first, which is meaningless. If I need to use the keyboard short-cut to open the context menu on the highlighted item, why do I need again to move the mouse pointer to it also <== excuse me .. this is not a short-cut!! The context menu can primarily be opened by a right mouse click only. 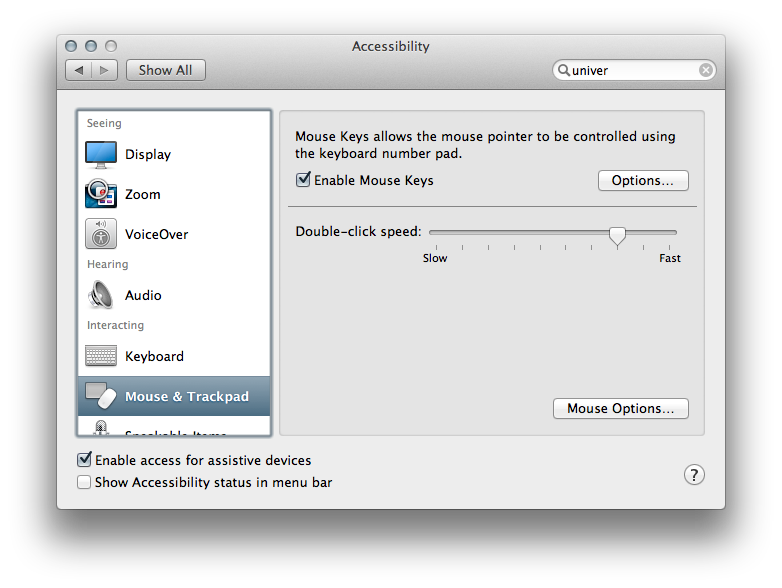 But in the Universal Acces settings in the System Preferences we can control mouse keys by using the keyboard number pad. When activated, a right mouse click then can be achieved by Ctrl+5 on a keyboard with a numpad or Fn+Ctrl+i on a laptop. This will allow you to 'right-click' your word. then with down-arrow and left/right-arrows you can choose the correct word. If you have "correct spelling automatically" checked and it doesn't seem to be working, it might be because you're trying it in an unsupported application. E.g., I can use the feature in TextEdit and Pages but not, e.g., FireFox or SublimeText 2 (two of my most used apps). Tho I've spent way too much time looking, I haven't found any way of getting the suggested spellings from the context menu with the keys alone. The best option I've found so far is to use my thumb on the track pad to position the mouse and then hold ctl and tap (again with the thumb). It takes a bit longer because of the need for positioning, but at least I can keep my fingers on the home row. I find it awkward to reach the ctl button, so I've used KeyRemap4MacBook (which is generally awesome and free) to customize the layout to make caps lock be ctl. KeyRemap will also let you assign ctl + click to button combinations, so you don't have to tap/click. You can use Better Touch tool to set up any tap/swipe/click/key combination to the right click. A 'context click' can be mapped to a key/key-combo using all native Mac OS X features (thanks to its NeXT/OPENSTEP heritage). However, the solution is pretty technical "under the cover" stuff, and it may take some trial-and-error to get it to work. Read about Key Bindings here, and follow (some) of the instructions to create your own ~/Library/KeyBindings/DefaultKeyBinding.dict file. Now I should be able to hit either Ctrl-F13 or Ctrl-; to get the context menu. NOTE: You will have to quit & relaunch an Application to have it pick-up changes. (Worked for TextEdit in 10.10) Otherwise, log-out & log-back in. I use Alfred with RightClick workflow. I mapped Option+CMD+Enter to trigger a right click in the frontmost application. RightClick used to work only in Finder but it was improved to work in most applications. To me it seems that most windows on mac F-keys can be called this way. To bring up the spell check use cmd + :. Cmd-shift-: Opens "Spelling & Grammar" on Chrome for me with El Capitan. It's a clunky bodge but I can now spell check. For Word 365 on Mojave, 'Shift'+'F10' does the trick. If you have a Touch-bar on your MBP, you would need to press the 'fn' key to bring up the function keys. Here is my solution on Github. This is a little AppleScript that I wrote making a control-click that you can assign to key of your choice using a shortcut utility app of your choice. Not the answer you're looking for? 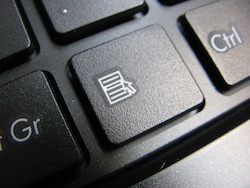 Browse other questions tagged lion keyboard shortcut-menu spellcheck . How to remap 'Context Menu' key on external keyboard? 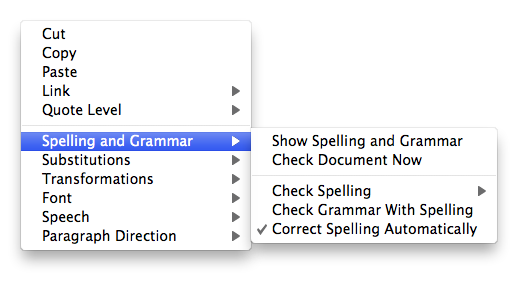 Does disabling auto-correct in Lion also disable spell checking? Are the keystrokes under guest Ubuntu via Virtualbox supposed to be the same in a Ubuntu? How can I make my Windows keyboard shortcuts work on a Mac, exactly how they do on Windows?